When Cindy Crawford stepped out of a red Lamborghini to fetch herself a can of Pepsi in 1991, our lives changed forever. And, like millions of people across the globe, we obsessed over it. Other generations shared the sentiment over Madonna (1980s) and Britney Spears (2000s). 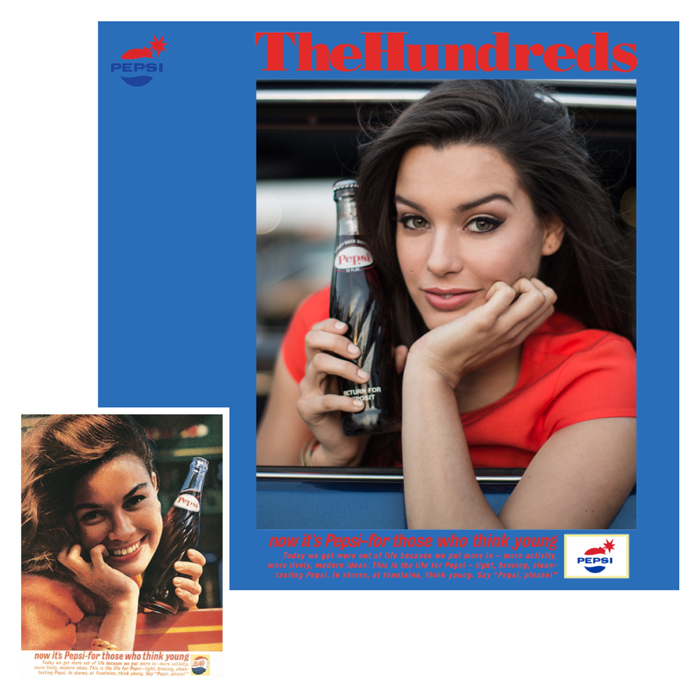 Flipping through Pepsi’s archive and seeing the iconic art, imagery and women who were part of it is literally a journey through pop culture Americana. 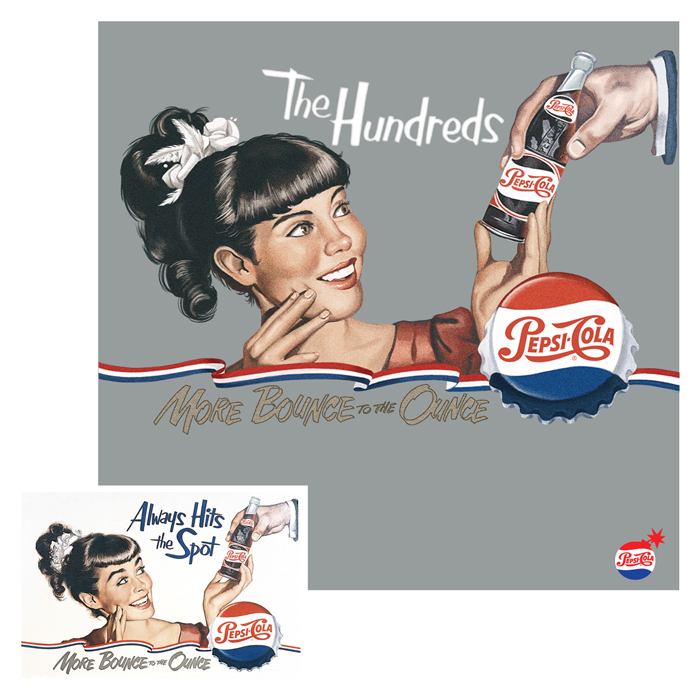 Seizing the opportunity to work on this one-of-a-kind project with Pepsi and share a part of their place in American culture, we chose our favorite ads from the ’40s to the ’00s and reinterpreted them The Hundreds way—featuring the beautiful Denise Schaefer shot by Bobby Hundreds or drawn by The Hundreds graphics team. For 2015, we created our own Pepsi Perfect campaign, topping off an eight-piece collaborative tee shirt collection that chronicles nearly a century of Americana as seen through the eyes of The Hundreds and one of the most renowned brands in history. The Hundreds X Pepsi collection is an opportunity to own a piece of this heritage and will be available at The Hundreds Retail and fine streetwear shops worldwide, beginning Friday, November 20. 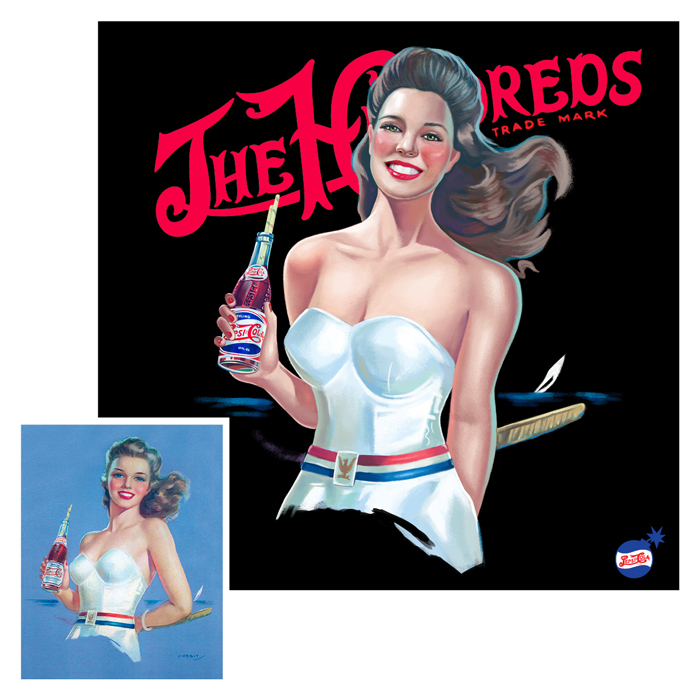 Reinterpreted by our design team, this graphic derived from Pepsi’s vintage postcard of a hand-drawn pin-up girl from the 1940s. Our reenactment of a vintage Pepsi print advertisement, featuring Denise Schafer. Inspired by a popular Pepsi print advertisement from the 1970s, evocative of the culture of “free love” of the era. In the 1980s, Pepsi continued their tactic of signing big names to their marketing campaigns, this time landing on Madonna. Part of her deal was to release a television spot featuring Pepsi and her new song, “Like a Prayer.” But the commercial only aired once before her personal music video—featuring “sacrilegious” content—stirred so much controversy that the Pope himself banned Her Virginess from entering Italy. So Pepsi pulled the plug on the whole campaign. You can no longer find Madonna Pepsi ads in America, so ours is based off an advertisement found in Spain. Perhaps more than any other Pepsi campaign, most remember the commercial starring Cindy Crawford, the most popular model of the moment. She was the hottest, coolest pop culture icon of the ’90s, and Pepsi solidified her position with their unforgettable commercial. Pepsi’s use of Britney Spears for their marketing campaign was indicative of the early 2000s, seeing as a phenomenon occurred where companies transitioned from using models as the face of their advertisements to singers and pop culture celebrities. So we re-captured this moment in history, The Hundreds’ way. The “Future” graphic is the only one in the collection that isn’t directly based off a previous Pepsi campaign. Using Back to the Future II’s Pepsi Perfect, we created what we believe an advertisement for the fictional soda would look like in 2015. Of course, with a little bit of The Hundreds sprinkled in.